Thanks to all our local neighbors and vendors who have donated goods and services to Irondale's Birthday Party! 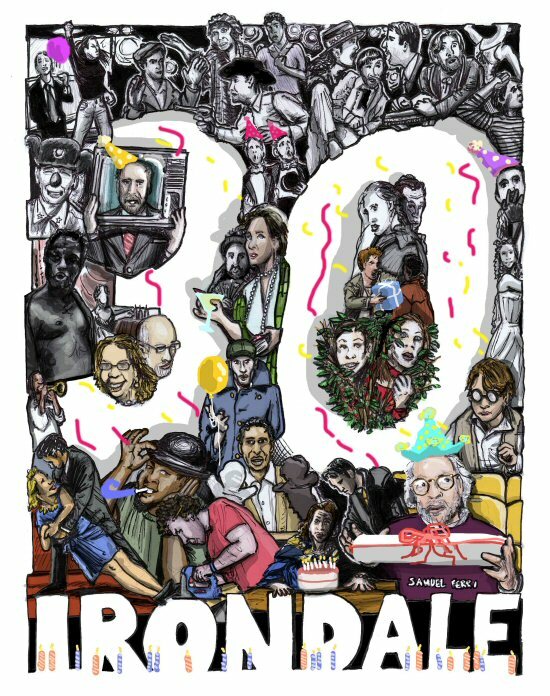 Irondale Turns 30 this year! Come Help Us Celebrate June 8, 2013! With an amazing menu sponsored by The Smoke Joint and B&C Restaurants! Ah, nothing beats Ft. Greene in early June. You’ll be sipping on some classy cocktails, tapping your toes to live swinging 30s jazz music and munching on perfectly prepared grillables. Be sure to utilize the Speech Bell if you’re feeling inspired to make a toast! Food is being generously provided by The Smoke Joint and B&C Restaurants! Performances by The Matt Feick Jazz Project, Rolf Sturm with Michel Gentile, and Erin and Her Cello. Live Art by Sam Ferri and Jake Nelson. Come see theater the way it was meant to be seen! Engaging! Enthralling! Enlightening! See Irondalers past and present come together in one revelrous performance after another! Catch a glimpse of the famous Sylvia London! Eat delectable birthday cake! Try your luck at the all-night Bucket Raffle featuring prizes from local Ft. Greene business, restaurants and bars! The fabulous Shelly Watson, whom Carson Daly described as “the centerfold of Opera,” hosts an evening of performances by The Civilians, the Strike Anywhere Performance Ensemble, The Ume Group, Irondale (Canada) and, of course, Irondale Ensemble Project.Libations provided by our generous sponsors. Groove, drink, dance and experience how Irondale does Brooklyn on a Saturday night. DJ’s spin everything from trip hop and bee bop to boogie-woogie and electroswing, anything to get your booty shakin! Spy sizzling burlesque acts and spellbinding aerial performances by The Love Show, Chicava HoneyChild, Aimee German, Kiebpoli "BLACK*ACROBAT" Calnek, Foxy Vermouth, Bombazeen Bean as the Shut the Front Door girls show you how get down with all your bad selves. And libations from the Balcony Cafe will keep the party going into the night! Free PBR from 10:00-10:30! Live lighting design by Nolan Kennedy. Going to a theater company’s 30th Birthday party? Here are some great gift ideas!!! Can’t make it? Give to our 30 Year Campaign!